Time for one of our periodic check-ins on our real world transportation pricing experiment in Louisville, Kentucky. As you recall, we’ve been watching Louisville closely, because just at the end of last year, the city started what amounts to a laboratory experiment in transportation behavior. Kentucky and Indiana built a new bridge to double the capacity of the Interstate 65 freeway as it crosses the Ohio River near Downtown Louisville. At the same time, it put tolls on the I-65 crossing, but not on the nearby Second Street Bridge, an older, four-lane highway bridge that connects Louisville to the Indiana suburbs north of the River. As we reported in February, the initial month’s worth of data on bridge traffic shows that adding tolls (which run from $1 to $4 for cars) have caused traffic levels to fall by almost half, from about 122,000 vehicles per day to about 66,000. We showed photographs from area traffic-cams that show rush hour traffic on the tolled bridges almost empty, while traffic was fairly thick on the free Second Street Bridge. As you can see, traffic on the tolled I-65 bridges was still very light. (The photo below was taken about five minutes after 5:00p.m. on April 20 and comes from the local “TRIMARC” traffic monitoring website.) The peak direction of traffic is moving away from the camera’s vantage point, on the right hand side of the photo, northbound, from Downtown Louisville. 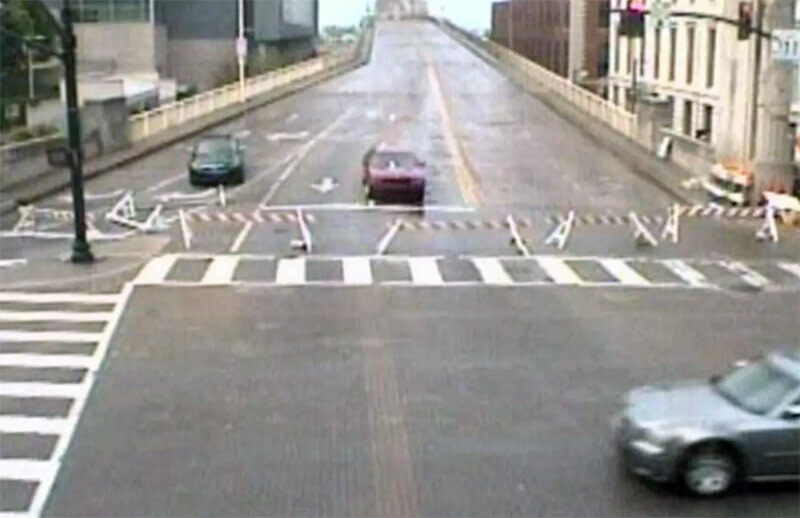 As noted, the Second Street Bridge was closed with barricades. This is the bridgehead in Downtown Louisville. What these images suggest is that, even with the nearby free alternative closed, there’s way, way more capacity on I-65 than there is peak hour demand for travel. You can compare these photos to ones we captured two months ago (below) when the Second Street Bridge was open to traffic at rush hour. While ostensibly the crossing was widened from 6 lanes to 12 to eliminate congestion, the real congestion-fighting investment was the decision to ask users to pay just a portion of the cost of widening the road. With tolls in place, drivers have voted with their feet (or perhaps, wheels) that they didn’t really need additional capacity. Charts showing trip purpose (left) and trip distribution by time of day (right). From ORBP’s 2013 traffic and revenue study. There’s another point as well. It isn’t just that traffic has shifted to the “free” alternative. It’s that with tolling in place, apparently many other trips just simply evaporated. That tendency of traffic to disappear when there’s a toll is an indication that people have much more flexibility about when, where, and how much they travel than is usually contemplated in policy discussions or travel demand models. The mental model that says traffic levels are some inexorable natural force like the tides, which must be accommodated or else, is just wrong. Of course, photos of one moment in time (even at the height of what should be rush hour) are hardly the best evidence of how well a bridge is being used. For that, we need actual traffic counts–the kind of data that would be generated, for example, if you had cameras, and license plate readers and transponder readers on a bridge, which is exactly what we have on I-65. But while Riverlink, the toll-bridge operator quickly posted January’s weekly traffic counts on February 1, its website has no new traffic data for the intervening two-and-a-half months. In fact, the Riverlink website which featured more or less weekly press releases since November, contains no new press releases since that February 1 traffic data report. There are many reasons why they might not yet have pulled together the data, and we’ll be watching eagerly to see when it becomes available. But we couldn’t help but notice a story that appeared in local press this month. It turns out that the Kentucky Transportation Cabinet has just signed a $300,000 contract with a Florida consulting firm to help it “determine whether the toll revenue generated by the RiverLink bridges is enough to make debt payments on the project’s bonds.” The financing of the widened I-65 crossing (and another beltway freeway crossing several miles to the East) hinges on tolls generating enough revenue to repay the bonds that Kentucky issued to pay for the project. If toll revenues don’t grow fast enough in the years ahead, the state will have to find some other source of funds to make these payments, which could make this particular experiment in transportation behavior a particularly expensive one. Stay tuned! 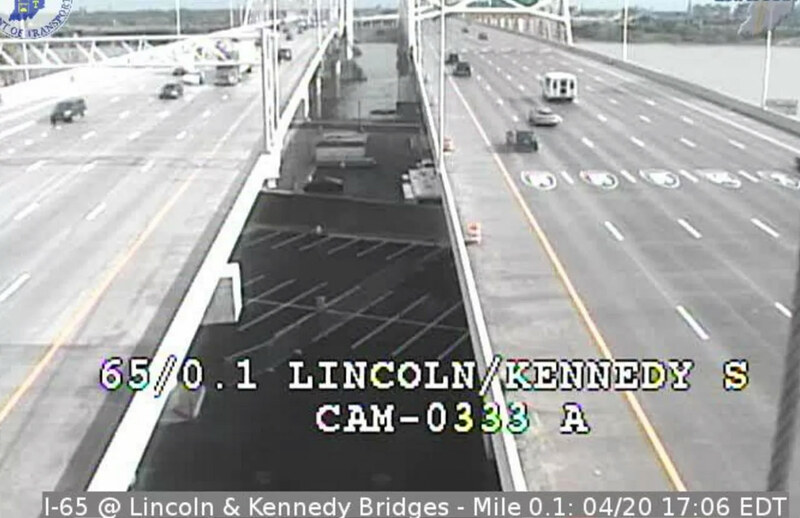 It might help credibility if the author recognized that the Kennedy (right bridge in each of the I-65 images) is the *southbound* bridge, and the Lincoln (left in each image) is the *northbound* bridge. The differences in the superstructures are readily apparent. It might also help credibility if the author would factor in the effect of the east end bridge. Anecdotal reports indicate that traffic along I-65 between the Snyder (I-265) and downtown have dropped sharply since the east end bridge opened, which would (obviously) affect traffic counts on the I-65 bridge in the downtown Louisville area. so we needed the east end bridge only. A five year old could tell us that Tom. Good points, Tom. The author also should have considered the Sherman Minton bridge. It would be interesting to know how its use has changed. I for one have used it more in the past five months than I had in the past five years. Isn’t it pretty much a fact that the two bridges weren’t constructed because the data and projections demanded them but rather because of a terrible political compromise? Sad to see reality is bearing that out while we all pay the cost. I would like to see a study on the effect (positive or negative) that the tolling has had on the Louisville area regional economy. I suspect it has been a drain, but I would like to see facts. Byron, I work near the Spaghetti Junction mess. I recognize that there have been monumental safety improvements to that area (albeit at the cost of a LOT of more attractive streetscapes that, frankly, I would rather have than I-64 going through downtown). When the Sherman-Minton was closed for a day eight or nine years ago over a bump from a stray barge, it should have awakened the powers that be that putting too much traffic on too few bridges was a bad idea. The several months that the same bridge was closed should have told those powers that their idea was problematic. I really think (and have been saying for several years, even prior to the start of construction) that the money would have been better-spent to build things like the Clark Bridge in several places–Portland to New Albany, Utica to Louisville, just upriver of Jeffboat to Blankenbaker Lane, for example–and diligently enforce a thirty-mile-an-hour speed limit on those bridges. That would have taken a LOT of traffic off the Kennedy, allowed more real neighborhood connectivity (including access for pedestrians AND cyclists), and probably cost less money. Well, at least we gave it 4 months before reaching the ultimate conclusions that were NOT, definitely NOT, predetermined based on certain biases. I mean, if you build a $2.5B infrastructure project, you’d definitely expect it to reach capacity within 4 months. You’d definitely expect the local economy and development patterns to shift accordingly to maximize its use within 4 months. Oh well. Good try, Louisville. The folks who had it right, was 8664 people, When i heard there argument i agreed they were right. Now with the powers to be always being a safe bet for democrats, why should they listen to us? The bridge should have been built in SW Louisville on the gene Snyder 265 and repeated Cincinnati idea of no trucks downtown. The biggest problem with 65, is usually attributed to a truck accident. If that was done, then trucks going to go east could use east end bridge(I-71) if going west(I-64)…SW bridge if going west, going north well truck would have to go around. ,. but why do that, it would make sense. and no politician makes sense in Loo-e- vall KY. just look at Yarmouth, made money running the cave under his house. In a recent conversation with a Kentucky transportation official in the know says the word is the estimates are that electronic capture rate failure is running 15% and that the vehicle count is 20% below projections. Why exclude info on the Sherman/Minton’s traffic? Must have had some extra use during Thunder. So many DOT apologists here. It’s obvious the bridges project was a big miscalculation, and a slow moving failure heading toward default. I live in New Albany and I have not used it since it opened. I used to if I was over in the area, now I’m more inclined to use the second Street, and on nice weather weekends I’ll bike over the Big Four. The tolls are outrageously high and is like buying a large Quills coffee each crossing. I’d rather have the coffee and a couple extra minutes in the car or on my bike to drink it. @CocoNoriega – yes, the downtown bridge was built to appease the 42 corridor crowd. @Tom: yes. There is plenty of research and data that show “local access bridges” are much less expensive to build and provide ample access. @All: so who gets hooked for bridge expenses once RiverLink confirms revenue shortfalls? & all to prevent the 42 corridor people from endlessly blocking construction of the EEB. Whether the project will be successful or not may be up for debate, but I echo others that this post is seriously deficient in providing adequate information. No reference to the existence of the other 2 bridges in the area. As a daily driver over the 65 bridges, it’s been a refreshing driving experience compared to the years of traffic jams prior. Sadly, I don’t doubt that they could have issues in their projections, and I worry that the tolls will be here for generations to come (ask D.C.drivers), and will most likely increase in cost and spread to the other bridges sooner rather than later. Then, we will unfortunately see a massive economic hit to either IN or KY.
@ Dave – Right! These bridges are not built for todays traffic, but the “promise” of increased regional development and related demand. We’ll see if that happens, but evaluating purely on the short term is short sighted. Has anyone asked to see the open receivables from their financial statements? It is just as important as how many crossings take place- how many people are actually PAYING for their crossing!?! I bet the average days to collect will be astounding and should be a metric that is closely watched.